Product code: R482 Categories: Sold Items, Sold earrings. These are a magnificent pair of 18ct white gold Retro diamond earrings from the 1940’s that are destined to always be admired and commented on. Retro jewellery has come back into vogue in recent years and rightly so thanks to the fabulous bold designs that always seem to catch your eye no matter the time of day or night. Each earring is set with twenty four diamonds with both earrings having a total weight of 1.05 carats, and the design that they are set in is just magnificent! With a lovely flowing design to them that seem to capture the light no matter which way you turn your head, each earrings measures 14.5mm across by an elegant 27.6mm that really allows them to follow the lovely curve of the ear. With earrings such as these, there is little doubt that the hair will be worn up to show the beauty, grace and elegance of these magnificent earrings. 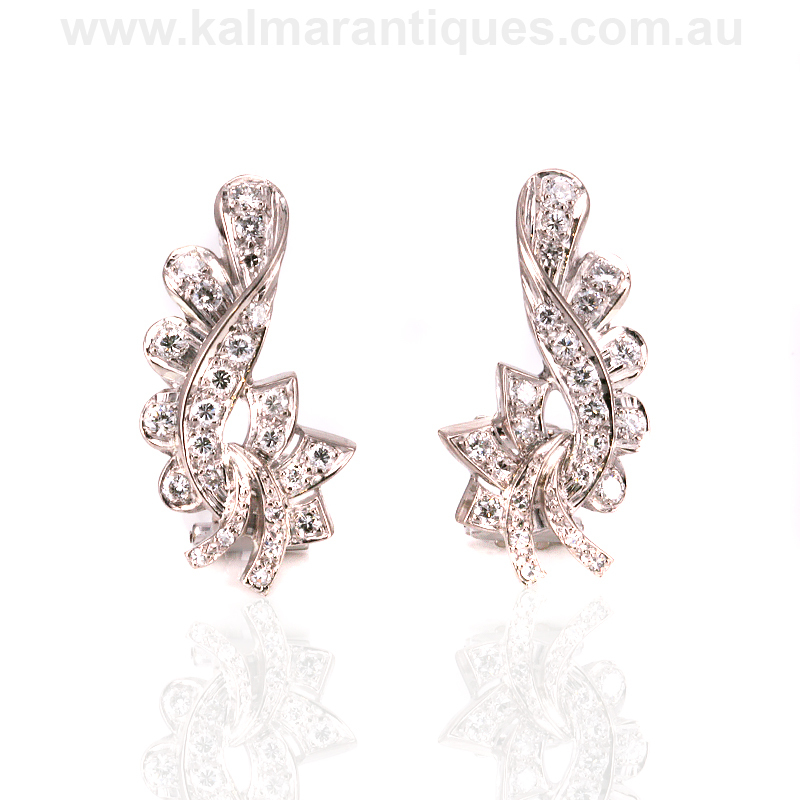 18ct white gold Retro diamond earrings from the 1940’s. A brief history on Retro jewellery of the 1940’s. Retro describes jewellery produced between the later part of the 1930’s to the 1940’s, and also includes World War II. The styles and designs of the Art Deco jewellery still influenced designers in this era.The retro movement was can be considered to be started by the head of Christie’s jewellery department, Francois Curiel. He named the era for customers who requested jewellery with the Retro look. His realization of this era brought great popularity and prestige to retro jewellery, resulting in the increase in value and price to these designs. Retro jewellery can be easily characterised by large chunky somewhat over the top designs in not only brooches and bracelets but also rings. The use of rose gold was also quite common even in 18ct.